Underground Railroad Shelter is a picture, with genre photograph. It was created in 1997. Sharon Flint Residents' Association Historical Committee is the Contributor. According to oral tradition, fugitive slaves found lodging on the Ozem Gardner land in a structure that looked like a dugout. A small one room structure, it was built into the bank of the creek that flowed through the Gardner farmlands. Possible uses for the structure may have been storage or a site for burning brick. The runaway slaves found shelter there until Mr. Gardner could assist them on their trip to the next station along one of several underground railroad trails that continued from that location. It has been said that on cold nights, Mr. Gardner brought the travelers into his house for warmth. An infant of one of the travelers died and was buried in the home's basement, according to reports. 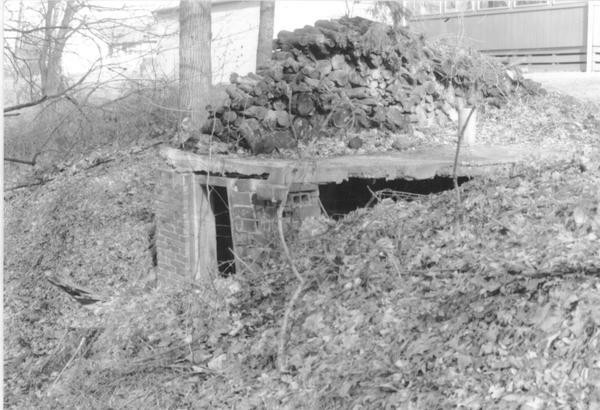 This photograph depicts the shelter as it stands in contemporary times. It covers the topics Underground Railroad, African Americans and slavery. It features the person Ozem Gardner, ?-1880. It covers the city Columbus. It covers the area Flint. You can find the original at Sharon Flint Residents' Association Historical Committee. The Worthington Memory identification code is sfr0003. This metadata record was human prepared by Worthington Libraries on September 25, 2002. It was last updated March 18, 2019.